For several years I tried to kill the huge green vine at the side of the house. I hacked at it every spring as it sprang to life with its long, green tentacles, cutting branch after branch with an enthusiasm usually reserved for quackgrass in the vegetable patch. The vine was planted in a ridiculous place. 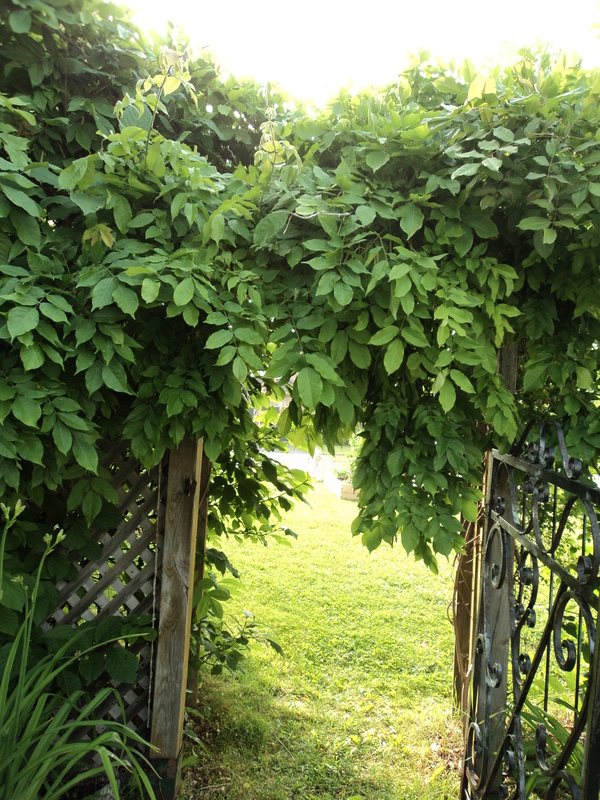 It was actually two vines, one on either side of a wooden arbour that framed the gate to the backyard. The previous owners planted them, along with a spring-blooming clematis and lilac in the very same spot. It was a crowded passageway, and not particularly attractive one, either. Year after year I hacked at that vine. Year after year it blithely carried on, green, boring and persistent. And then last spring, I saw a strange bit of purple in the vine. Upon closer inspection, I discovered more that just a bit: there were enormous, purple blooms dripping from the branches. I couldn’t believe my eyes! Turns out, my plain old vine was a wisteria. Wisteria not only tolerate constant pruning; they require it. They are also fickle: the first three or four years after planting they won’t bloom, and even after that they may refuse. All this time I was trying to get rid of it, and it rewarded me by thriving. Sheesh! Enchanted with my newly discovered wisteria, I let my vine grow last summer. 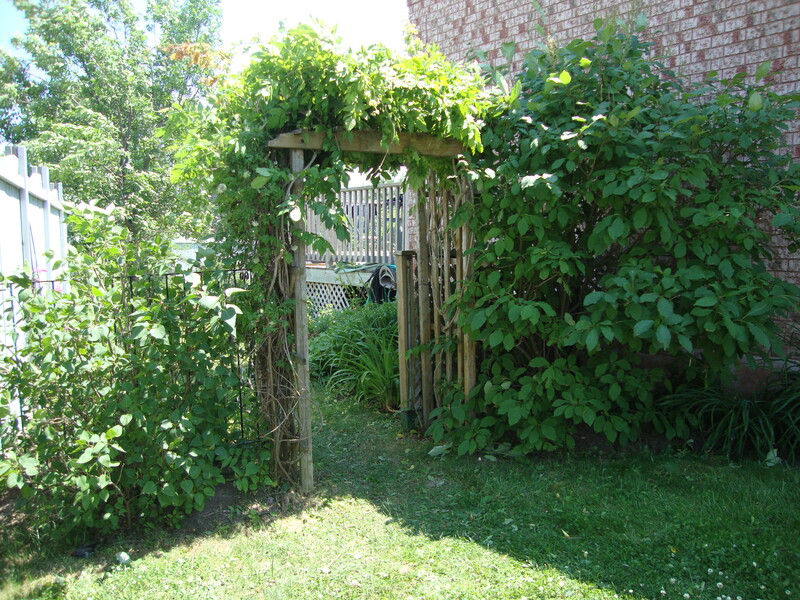 Unfortunately, without my constant hacking at it, the vine had grown so much it now threatened to obliterate the two lilac bushes–to say nothing of the poor, suffering clematis underneath it. 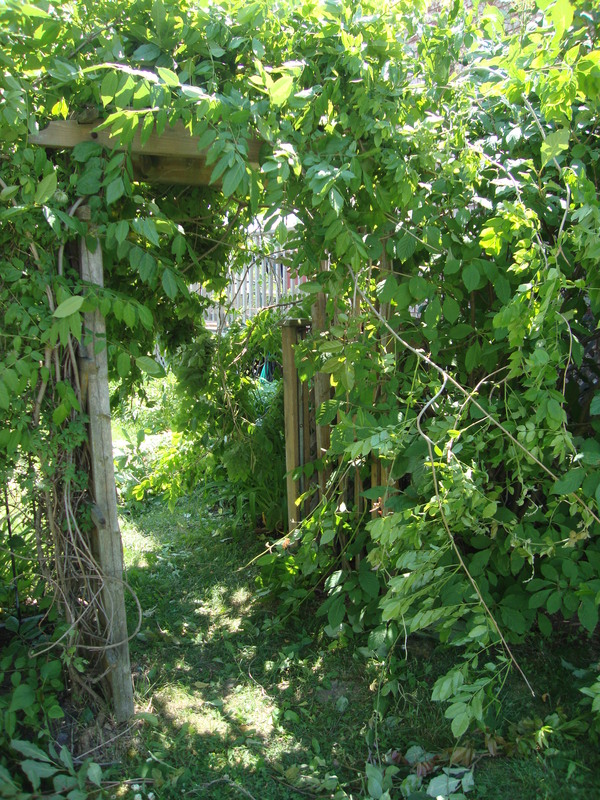 It may have offered up those lovely purple blooms again this spring, but for weeks I have been looking at the overgrown mess and plotting how I might corral it. I started with the nearby lilac, knowing it needed a bit of a trim, too. Having visited the royal Botanical Gardens during the lilac festival, I had been taught exactly how to prune them. Sadly, standing in front of the bush, I remembered absolutely nothing their expert taught me. I set to trimming anyway, snipping off spent blooms and removing the dead and crossing branches the way I would any other bush. That seemed to work out just fine until I ran smack into the dreaded vine. I tried to pull its twisted branches out of the lilac. I tugged. I yanked. I wrestled. But it was so firmly entangled I eventually gave up. I stood on the lawn and took a minute to regroup. My son Andrew wandered by and told me what I really needed was a chainsaw. That would fix it for sure, he said. I stood underneath the vine and found that this was a much better way to attack it. From there I could snip a few of the smaller branches and untangle some others. After what felt like an eternity, I had set the lilac free but the vine looked worse than ever. Now what? I will train the vine to go the other direction, I thought, and help it reach the fence where it can sprawl at its leisure. I began twisting the branches this way and that. Some of them broke; most of them paid absolutely no attention to my redirection. I decided to prune a little more heavily. Experts say you can remove an entire third of the shrub without hurting it, I said to myself. It will be fine. But it was not fine. 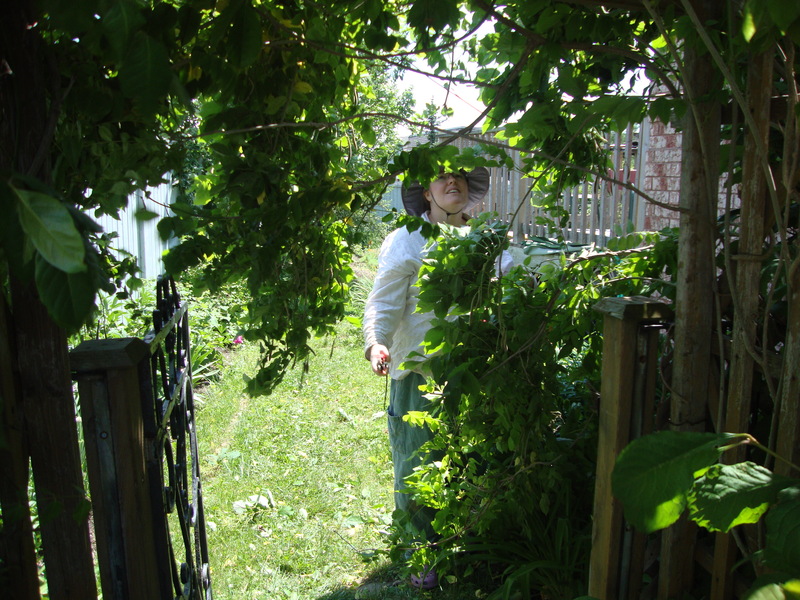 I snipped and snipped, and then stood back and discovered I still had long, unwieldy vines sprawling out over the arbour and onto the grass. It reminded me of untrimmed eyebrows, sticking out in all directions and looking remarkably unattractive. I ended my afternoon feeling defeated. I had naively waded into this war between the lilac and the wisteria thinking I could help them both: I will just trim a bit, coax a bit, and help them get along, I thought to myself. I will tidy things up, bring them under control, give them each the light and air through their branches that they need. I will make them happy. Sadly, in the end all it did was try my patience and leave a backyard entrance that, as Andrew helpfully observed, “looked like it had a buzz cut”. I suppose no one ever said that keeping the peace is an easy thing to do. Maybe in my garden it will even prove impossible–I wouldn’t blame the wisteria in the slightest if it decided to give up. I suppose for now I will take solace in some happy lilac bushes and a clematis that finally has some fresh air. I will also make a mental note to plant with an eye to the future, knowing that gardening peace may hang in the balance. This entry was posted in Uncategorized and tagged garden, gardening, nature. Bookmark the permalink.